We have proudly serviced thousands of lawns across Central Texas. We have seen a lot since 2006, but here are some of the common things we encounter. St. Augustine grass is a warm season lawn grass that is popular for use in tropical and subtropical regions. 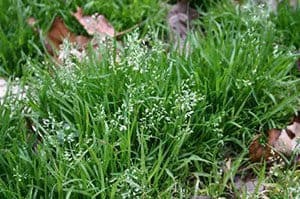 It is a low to medium maintenance grass that forms a thick, carpet-like lawn, crowding out most weeds and other grasses. While it is very popular in Central Texas, it can be prone to drought stress in the hot summer months without proper watering. Common St. Augustine issues are brown patch fungus, leafspot fungus, chinch bugs and grub worms. Bermuda grass is native to warm temperate to tropical regions such as the Sunbelt area of the United States. Bermuda grasses are valued for their drought tolerance compared to most other lawn grasses. Common Bermuda grass problems are grubworms, bermuda mites, leaf spot disease and occasional fungi. If your lawn is 80% in the sun or higher, then Bermuda grass is the grass for you. It loves the sun. Zoysia can tolerate wide variations in temperature, sunlight, and water, these grasses are among the most widely used for lawns in temperate climates. They are used on golf courses to create fairways and teeing areas. Zoysia is excellent at repelling weeds throughout the year. Zoysia is a slow growing grass, so recovery from damage takes a while and that is why preventative measures are best used with Zoysia grass. Buffalo is a difficult grass to work with. It’s often touted as being more drought tolerant than other grasses, but Bermuda grass is just as drought tolerant and not nearly so problematic. You can’t treat weeds with buffalo grass. We don’t recommend that you plant this type of turf in your yard. This is a broad-leaf weed that will bloom in early springtime and is probably one of the most plentiful weeds in Central Texas. It has rounded leaves with notched edges that grow every inch or so on a square stem. The stems are pretty weak so the taller the plant gets the more it tends to lean over. The flower is a purple color that blooms at the very top of the plant. Left unchecked it can easily take over large areas of your lawn. It is best to get a pre-emergent down in winter but it can be controlled with our broad-leaf weed controls. Another common disease in Central Texas is Leaf Spot and it is commonly seen in late spring to early summer in lawns that get a lot of moisture. Individual blades will have small brown spots that are usually oval and have a darker brown border. Damage from leaf spot can cause problems during the summer when the damaged areas can’t handle the hot and dry conditions and die out. Early treatment with fungicides is best. Take-All Patch is easily the most devastating lawn disease that we have in Central Texas. The disease does what its name describes and damages all part of the grass from the roots to the blades. It starts with yellowing of the blades but quickly turns to dead areas. The grass will be easy to pull up since the roots are gone and usually areas of bare dirt will appear. Fungicides are minimally helpful and early detection is key to preventing the damage from spreading. Fire ants are not native to Central Texas and are often referred to as “imported”, or Red Imported Fire Ants. Any given fire ant colony may have several queens, which are fed and protected by the workers. Fire ant queens can fly and often relocate a nest by flying to a new spot and beginning to lay eggs. Fire ants bite aggressively when their nest is disturbed and bites can be extremely painful. Emerald Lawn service offers effective treatment for fire ants that lasts for up to one year with just one application. Adult chinch bugs have slate-black bodies with silvery wings that cover most of their back. The color pattern on the wings and the overlap across the back give them an hourglass or crossed-arms pattern. When a lawn is infested with chinch bugs, damage appears as orange, dead blades of grass, beginning in the hottest, driest areas. A lawn that has gone through drought stress is much more susceptible to a chinch bug infestation. White grubs, or grub worms, are the larval stage of June bugs. These bugs live beneath the turf and can cause severe damage to the root system of grass and some shrubbery. Though grubs are native to Texas and most lawns contain some presence of white grubs, an abundance in any particular area can cause massive damage that first appears as drought stress, and can destroy an entire lawn. White grubs have a white colored body with a reddish-brown head and can typically be found during the early summer beneath the soil surface. Mites are very small, only 1/100” in size, so they cannot be seen with the naked eye. The mites feed under the leaf sheaths, sucking sap from the plants. The can go from egg to adult in 7-10 days, so the population can quickly explode into a damaging level in the turf. As the mites feed on bermudagrass, the plants shrivel and develop a “witches broom” effect or what looks like a tufted growth on the stem. Yellowing and wilting then can occur, giving the appearance of drought stress and thinning turf. Armyworm outbreaks are difficult to predict but infestations seem to occur in portions of the state every year especially after early fall rains. Damage consists of foliage consumption. The small larvae will chew the green layer from the leaves and leave a clearing or “windowpane” effect. The adult fall armyworm moth has a wingspan of about 1.5 in. The hind wings are white; the front wings are dark gray, mottled with lighter and darker splotched. On male moths, each forewing has a noticeable whitish spot near the extreme tip. Powdery mildew is caused by a fungus and is seen as a light gray or whitish powder on the surface of leaves. It occurs following warm days and cool nights often being seen in the fall and spring. Even though each species of powdery mildew attacks only a narrow range of hosts, there are 11,000 species of the powdery mildew fungi, and many ornamentals are hosts. Superficial powdery patches appear on leaf surfaces, young stems, flowers, and even fruit. Black mildew and sooty mold are often used interchangeably though sooty mold should be used for the black mold that grows on insect excrement (honeydew) that can coat the leaves, stems, and/or fruit of plants. The mold is not parasitic but can reduce the leave’s photosynthetic ability by blocking out light. It is a common indication that the plant is infested with piercing-sucking insects, such as aphids, scale, mealybugs, or whiteflies. Sooty mold can be removed by washing it off with warm soapy water. Controlling the insects that are causing the honeydew is required for long-term control. You might want to know how to identify aphids. It’s simple, really. You need to keep an eye out for black, sooty mold on your greens. This mold is caused by an abundance of aphids. Spider mites are less than 1 mm (0.04 in) in size and vary in color. They lay small, spherical, initially transparent eggs and many species spin silk webbing to help protect the colony from predators; they get the “spider” part of their common name from this webbing. Caterpillars are the larval stage of members of the order Lepidoptera (the insect order comprising butterflies and moths). Caterpillars, as a rule, are voracious feeders and many of them are among the most serious of agricultural pests. In fact, many moth species are best known in their caterpillar stages because of the damage they cause to fruits and other agricultural produce, whereas the moths are obscure and do no direct harm. Although several species of whitefly may cause some crop losses simply by sucking sap when they are very numerous, the major harm they do is indirect. Firstly, like many other sap-sucking Hemiptera, they secrete large amounts of honeydew that support unsightly or harmful infestations of sooty mold. Secondly,they inject saliva that may harm the plant more than either the mechanical damage of feeding or the growth of the fungi. However, by far their major importance as crop pests is their transmission of diseases of plants. The Tingidae are a family of very small (2–10 mm (0.08–0.39 in)) insects in the order Hemiptera that are commonly referred to as lace bugs. They are called lace bugs because the pronotum and forewings of the adult have a delicate and intricate network of divided areas that resemble lace. Their body appearance is flattened dorsoventrally and they can be broadly oval or slender. Often, the head is concealed under the hood-like pronotum. Lace bugs are usually host-specific and can be very destructive to plants. Most feed on the undersides of leaves by piercing the epidermis and sucking the sap. The then empty cells give the leaves a bronzed or silvery appearance. Each individual usually completes its entire lifecycle on the same plant, if not the same part of the plant. Scale insects vary dramatically in appearance; from very small organisms (1–2 mm) that grow beneath wax covers (some shaped like oyster shells, others like mussel shells), to shiny pearl-like objects (about 5 mm), to creatures covered with mealy wax. Adult female scales are almost always immobile (aside from mealybugs) and permanently attached to the plant they have parasitized. They secrete a waxy coating for defense; this coating causes them to resemble reptilian scales or fish scales, hence their common name. Most scale insects are parasites of plants, feeding on sap drawn directly from the plant’s vascular system. Get a Green and Weed-Free Lawn with Emerald Lawns!